Animal prints is something I never really got behind. It was something that I only saw on 75 year old blue-haired ladies that are way cooler than me or on kids who looked like walking cheetahs. Not really the look I go for. I’m not sure what kind of demographic I reach out there in internet land, animal print lovers or haters, but I’m sure your love or hatred won’t apply to this cake. 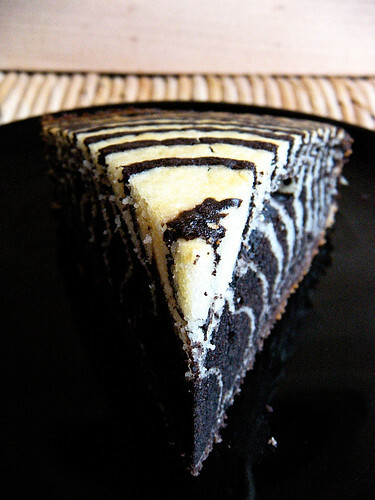 It’s a zebra striped cake. I said it. 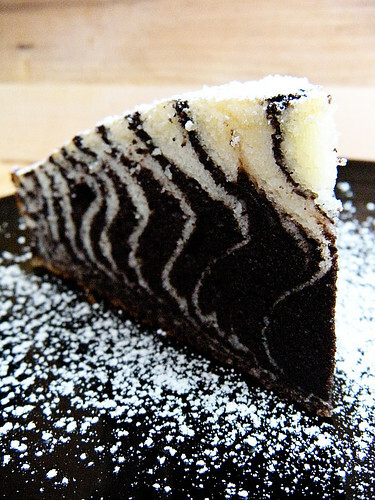 Zebra striped cake. And no matter WHO’s plate it sits on, it will ALWAYS be in style. This is a simple cake needs no pillowy frostings, no fancy ganaches, and no whippy creams. A light and beautiful dusting of powdered sugar, a plate and a fork… and you’re in business! 1) Preheat the oven to 350°F. 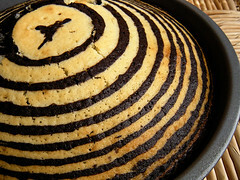 Lightly spray a 9″ x 2″ round baking pan with cooking spray (you can use a 8″ x 2″ for a slightly thicker cake). Line the bottom of the pan with a circle of parchment, and spritz again. Set the pan aside. 2) In the bowl of your mixer, blend the sugar and eggs until lightened, about 2 minutes. On low speed blend in the oil, milk and vanilla until well combined and smooth. 3) In a separate bowl, combine the flour, baking powder and salt. Whisk to remove any lumps. Add the dry mixture to the wet ingredients. Combine on medium speed 1-2 minutes or until the batter is smooth and lump free. Be sure to scrape down the bowl halfway through mixing. 4) Remove 2 cups of the vanilla batter and place it in the measure you used for the liquid ingredients. Sift the cocoa over this batter, and stir well to combine. Be sure to use a sifter to avoid cocoa lumps in the batter. 5) Now for the stripes. 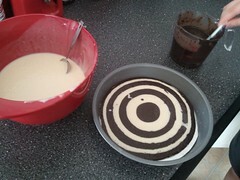 Spoon about 3 tablespoons of vanilla batter into the center of the cake pan. 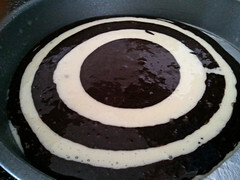 Next, spoon 3 tablespoons of the chocolate batter into the center of the vanilla batter. This causes the vanilla batter to spread out. Continue to alternate batters, in bulls-eye fashion until all batter is used. You will now have thin rings of each batter on the outer edges of the pan, thicker rings towards the center. 6) Bake the cake in the center of the preheated oven for 35-45 minutes, or until the cake is lightly browned and a toothpick inserted into the center comes out clean. Cool the cake in the pan for 10 minutes, and then turn out onto a wire rack to finish cooling. Dust lightly with confectioners sugar or frost if that strikes your fancy. Gorgeous- such a great presentation! Wow..this is a show stopper! Very nice!! Im not a animal print fan, but I like it in cakes!! I believe in judicious use of animal prints; have a couple of leopard and zebra scarves and sweaters that I love! But I’m a lot older than you!! 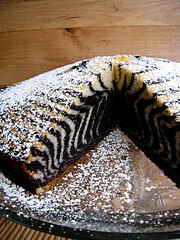 This cake is a perfect use of zebra!! Beautiful job. What a fun cake! I’m not even a little kid and I would be thrilled with this one! How fancy and delicious! I love it. This looks so cool! Much more impressive than a marble cake. Holy cow, Girl. 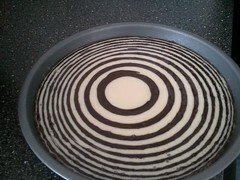 That is the best Zebra Cake I’ve seen. I even made one a few years ago, but it just didn’t look very good. Love the black. Mine was just brown. This is such a fun dessert – and you explained the technique perfectly. This would be just the right finish to many meals. Thank you for sharing! OH MY This is just stunning cake. I am sure it tasks really good but i can’t believe how cool it looks. Nice work! That is the most interesting cake! My kids will go crazy for this, thanks for sharing! This cake is so creative and a very fun idea! Gotta try this kinda thing. Gorgeous! What a fun cake. That is one gorgeous cake. I’ve tried making this before, but it never came out like yours! You guys should be ashamed of yourselves. You know good and well you shouldnt show me stuff like this. I’ll eat myself to death. This is amazing. Fantastic cake! This is amazingly cool. I can not believe that it’s that easy to make the zebra stripes. Of course, you’re probably so good that you make it LOOK easy but it’s in fact very difficult for baking-challenged people like me. Wow! That is so so creative and the cake looks absolutely beautiful! This is really really gorgeous. I’m not sure I could manage this! Well, pretty sure I could manage the eating part ;). Oh my gosh, that looks AMAZING! wow. Have been wanting to make this since I first saw it on the King Arthur Blog.. your photos are fabulous & I love the child eating it.. So great! holy wow! Now that’s cake! It look amazingly moist, will definately try this one day super soon – perhaps for my next dinner party. will bookmark and thank you so much for sharing your recipe – great photos too! I used this recipe, but dropped the chocolate and made a rainbow instead! I made this yesterday. The cake looked great, but was not that tasty, despite the fact that I used good quality ingredients. Quite crumbly and bland. I will likely try this method again, but not with this particular recipe. Cake’s in the oven right now, can’t wait to try it! I had more chocolate batter than vanilla, even though I followed the instructions to a T. Maybe it’s because Roommate bought jumbo eggs. Anyway, I’m getting half a dozen cupcakes out of this recipe, too! Next time, I’ll take out 2 1/2 cups of vanilla rather than just 2 if I still have jumbo eggs. This is deeeeeelicious! True, the cake fell a bit after coming out of the oven, but that just makes it wonderfully dense and a great cake on its own, no need for frosting. The taste of chocolate is not very strong, so maybe some adjustment could be made to use unsweetened chocolate or something, but still, this is great. Love it! Never thought of doing it zebra!! I am going to def try this!! So Beautiful! I can’t wait to try it. amaze by the special outcome!!! 100% a try out session for me! I absolutely LOVE this cake!!! Beautiful! Amazing cake indeed. I cant seem to get the circles right, Everytime I place the chocolate in the middle, the circle keeps on getting distorted. Any tips on how I could fix this?. BTW, my kids loved it. Fajas– maybe your chocolate batter is a bit too thick? Try thinning it with a splash of milk, not too much, just enough that it’s pourable without trouble. I love this! I’m attending a baby shower this weekend and have been looking for something to bake. 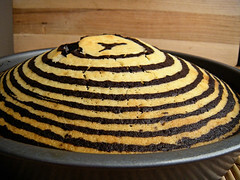 But I’m wondering, is it possible to manipulate the batter somehow to make a cupcake version of this cake? Diana, I hope it’s not too late to respond to your question. I have made cupcakes with leftover batter before and it works out pretty well! I suggest buttering or spraying your cupcake pans with cooking spray and nixing the cupcake liners. Let me know how it works out if you try this!! I’m just wondering if i could substitute milk for soy milk because I want to make this cake eatable for my vegan boyfriend? Chelsea, I haven’t personally tried to sub soy milk for regular milk but i don’t see why it wouldn’t work. I have used almond milk in place of cow milk with great success. If you try it, let me know how it works out for you! All I can say is WOW! I have been a Zebra hater all my life (well, since a Zebra incident when I was a wee tyke), but you have restored my love for them again. I can now eat my Zebras and have them too!!! Thank you for a win / win cake. Seriously, this is a very dramatic presentation, well done! Pingback: Fun for you and me… it’s TCT! « All I Eat Food! 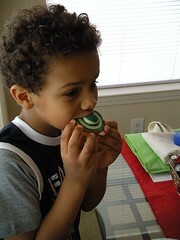 Looks so yummy and delicious, thanks for sharing! This cake is amazing… Simple, yummy, fluffy and gorgeous!! I made my friend a giant hello kitty cake and used this recipie with different colors in the Vanilla batter.. Hello kitty had rainbow insides and I thought that was fitting.. THANK YOU!!! I’m making this now with a Halloween theme. I used food coloring to make the vanilla batter orange. 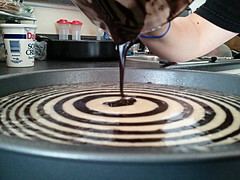 After pouring the batter, I used a knife to pull from the center and make a spiderweb pattern. Finishing it off with a couple chocolate spiders on top. FUN TIMES! Perfect for this time of year! Looks cool but lacking big time in flavor! My 16 year old granddaughter and I made one today using two cake mixes…the first pan was a little wierd, but then we got the hang of it…..what fun we had!! 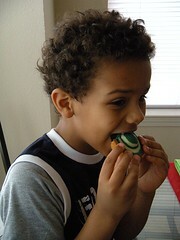 Loved doing it…and the creative juices can really begin to flow thinking of the different colors and different flavors. Thanks for posting. 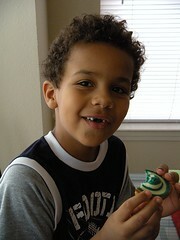 It has been the perfect Birthday-Christmas-Cake in 2011!!!!! This is amazing! My daughter is completely into animal prints and cake!!! I am totally going to make this for her! Then I am going try it with cupcakies!!! Thank you for your creativity!!! Such a beautiful cake!!! I have it in the oven now! One question though, the batter tastes kind of funny, anyone else have this issue?? This cake turned out to be beautiful!! A very creative way for a cake that I’m making for my friend’s baby shower which is zebra and hot pink. However, did anyone else find that perhaps the King Arthur flour caused the cake to lose it’s sweetness and ended to be very bland and dry, but still fluffy? Does that kind of flour matter or can you use regular all purpose flour and end up with the same result? I’m glad I did a trial run beforehand because I think the sweet lovers that will be at this shower would be a little unimpressed. Great idea tho, I love it!! Looks amazing! Def gonna try this for my sister’s surprise bday this wkend…she’s gonna LOVE it!! 🙂 One question though, can I use another type of AP flour or HAS to be that brand? amazing! love it! love it! and will make it for sure…thanks! That, my friend, is a cool cake. I’m planning on making this awesome locking cake for my boyfriends birthday party on saturday. I was thinking of adding a layer of jam every couple of rings – have you ever tried this? Do you think this would work? I’m not too sure if the jam rings will work, I have never personally tried it. I would suggest maybe slicing this cake into two layers (once baked and cooled) and spreading the jam between the layers. Let me know how this turns out for you!! This cake not only looks amazing, but it tastes amazing too! 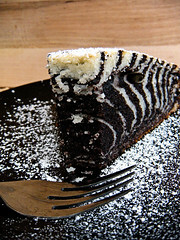 It is now my go-to recipe for any vanilla or chocolate cake, I just leave out the zebra part!